Otto Octavius and the Video Game Spider-Man meet a big new friend in Spider-Geddon #3. 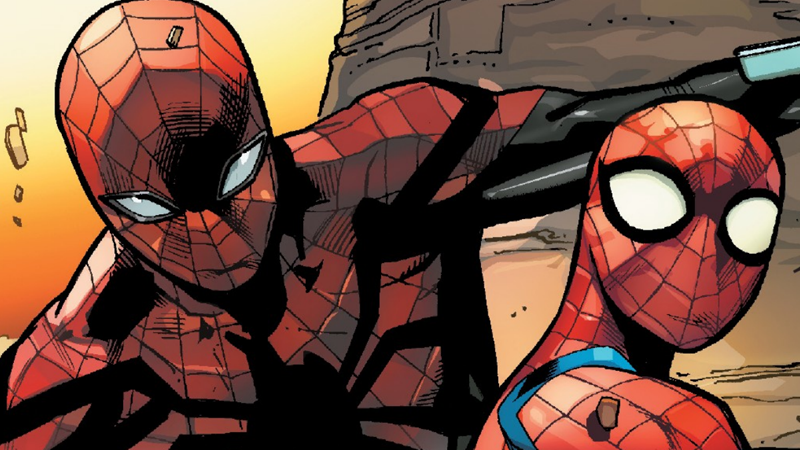 Marvel’s ongoing Spider-Geddon crossover event has already given us some intriguing developments, mostly in how it’s shown us it can keep a renewed battle with the Inheritors from Spider-Verse feeling fresh by offering a moral divide to fracture our heroes’ reunion. The question now lingering over Spider-Geddon is not so much if the Inheritors can be defeated again, but instead: Should they be killed in order to prevent this happening again? That question has seen two factions of Spider-heroes form—the “kill” side spearheaded by Otto Octavius, re-donning his suit as the Superior Spider-Man; and the “don’t kill” side, by Miles Morales and Peter Parker—and traipse across the multiverse seeking like-minded Spider-heroes to grow their respective causes. Both sides have been busy, but this week’s Spider-Geddon #3—by Christos Gage, Carlo Barberi, Todd Nauk, José Marzan, David Curiel, and Travis Lanham—opens with Otto (and another of his recruits, the Spider-Man of the recent PS4 video game) finding a crucial ally. It’s Takuya Yamashiro—star of the wonderfully weird Japanese Spider-Man show from the ‘70s—and his iconic giant robot, Leopardon. Otto and PS4-Pete find Takuya a bit busy when they first encounter him, fighting a giant monster in his equally giant robot, as all good Japanese superheroes frequently do. But with time on no spider’s side, Otto takes a jab at one of the oldest tropes in the tokusatsu book: Why doesn’t Takuya just open with Leopardon’s all-powerful ultimate attack and win immediately? Please note how completely ecstatic the PS4 Spider-Man is to be inside a giant robot. It’s both a perfectly Otto-ish thing to say, but also a riff on the tropiness of the giant robot fights seen in the likes of the old Toei Spider-Man series or the Super Sentai franchise that Leopardon’s creation went on to heavily influence. You scrap for a bit, start with a few basic attacks, get predictably shocked when they don’t work, and then eventually build up to your ultimate special move. That’s just...that’s just how it goes. And has been going for decades! But he takes Otto’s advice, deploying the “Sword Vigor” just as he did in practically every episode of the old Spider-Man show, and what do you know? The ultimate attack works. Whakaboom is a very good word. Even if Otto is right, so is Takuya’s retort: If he did that every time, giant robot fights would be awfully boring. And who wants that? Super Sentai and its tokusatsu ilk may be a little predictable, but at least its giant robots aren’t dull.